Artist Dan Klima puts on one show at Hot Shops Art Center annually, and this year he continues to make it count. All That is Round, which continues through July in the Nicholas Gallery, captures the essence of life cycles, weather, seasons, nature and organic flow because round objects are abundant on the Earth and rich with symbolism. 10 artists showcased their work on opening night, July 6th, including Klima, John Miller, Dennis Waltier, Herm Rauth, Matthew Shrader, Sara Sumnick Wamsat, Lori Elliott-Bartle, Deborah Murphy, John Dennison and Dan Toberers. Though each artist worked alone and didn’t consult each other, Klima seems to have achieved a continuity that flowed rather seamlessly. Klima’s focus is carving with wood to yield bowls and a lot of possibility for variety in design, and as far as managing the event, he said the magic is when the show starts to come together. There were black and white depictions of bird nests by Deborah Murphy and glass-blown marbles and other constructs by Matthew Schrader. One of Schrader’s glass art featured perhaps a large cup with a green, twisted straw climbing up the side. Sara Sumnick Wamsat’s “Circus Bowl” used orange well as the color split in rays from a blue star in the middle. Certain artists and their work were not to be missed. John Miller’s “Sophisticated Dream” almost had a glow to it under the light because of Miller’s oil paint on oak wood painted in distinct layers. This is a technique Miller is drawn to and excels at. The painting shows two girls embracing each other but crying in anguish, poised in opposite directions. “Those girls are characters I’ve used before, but each time I usually further the story going on with them,” Miller said. Miller’s work seems to be apocalyptic while mysteriously portraying scenes of still life in other works, such as “Still Life With Fire and Rain.” The painting was almost a miniature peak into a room, animated quietly to produce further mystique. Lori Elliot-Bartle created mandalas of the seasons using colored pencil. Winter’s mandala was entrancing and particularly depicted the fragileness of winter words with a detailed and defined snowflake. Her piece with the best story behind it started in China, and if you saw one work of hers, this should be it. “Dragon and Phoenix Mandala” was inspired by a jade carving from Ghangzhou, China. “I wanted to pay homage to what I saw in China,” Elliot-Bartle said. There she saw a carving of a dragon and phoenix entwined and caught almost in a circle. Her artwork skillfully showed how the two creatures were wrapping around each other, almost chasing each other. John Dennison created an array of large ceramic bowls, heralding the principles of pottery. 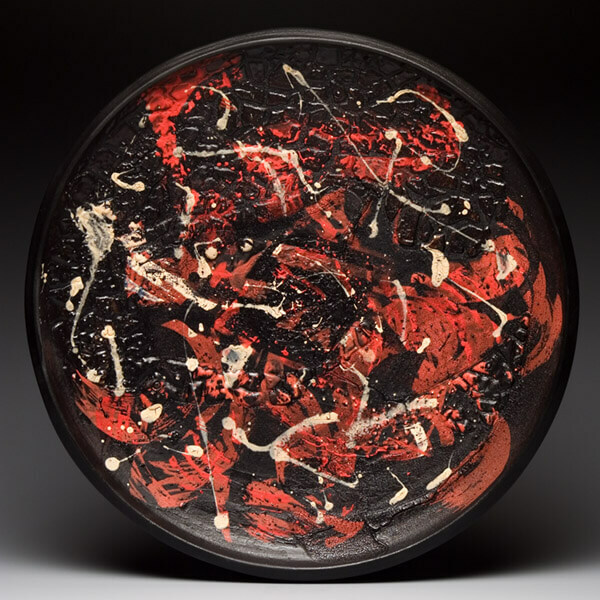 Dennison more than accomplished his attempt to show texture of splattered paints and figures inside the bowls. “These are an exploration of color rather than themes,” Dennison said. However, his use of Earth colors and warps on ceramics seemed to call upon a Native American influence. One bowl had orange, green and brown colors swirling in on each other, perhaps a sign of the seasons or maybe nothing more than a color preference. The show was cohesive. Some works were simply round while other paintings like “Sophisticated Doom” by Miller seemed to be surging with raw emotion. Elliot -Bartle said her work was mostly about mastering pencil with mandalas and Dennison mostly went out to experiment with color. However, the exhibit’s overall theme was well served by the art as well. Once again, All That is Round demonstrates that Klima knows how to manage and hang a show. If you missed the opening this exhibit also features a closing reception July 28. All That is Round continues through July at Hot Shops Art Center, 1301 Nicholas St. For more information, go to hotshopsartcenter.com.